The rattle is sculpted in response to nature and organic forms that blend harmoniously with a soothing sound. The tactile experience of the moving bead and organic textures encourage the development of the senses. Each rattle has a specific shape which is found within that particular piece of wood. 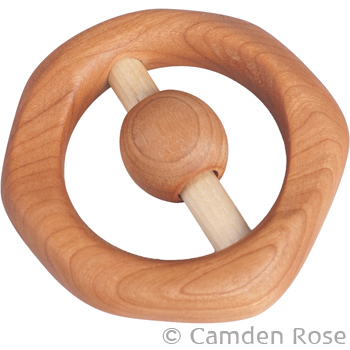 Our rattle is crafted from cherry with a contrasting birch dowel. After the rattles are sanded baby smooth, our All-Natural Beeswax Polish is hand applied to bring out the uniqueness of the grain.